Covers tend to have the job of selling the comic for a new potential fan and also gaining attention in general. Today we have 2 covers from DC for The Flash #8 and Aquaman #8, both seem to go different ways for the approach and they’re equally interesting in their approach. First up… The Flash #8, it’s a variant work by Bernard Chang, the approach taking on a comic panel appeal with less emphasis into a heavy graphic influence or even a more painterly direction. 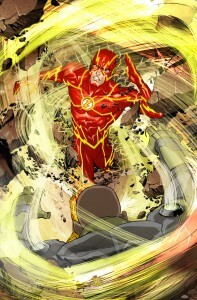 It’s actually a distracting panel as the speed and energy draw attention over to the flash instead of the more cartoonish head of the person he’s approaching. As the artist reveals, this was only one of many ideas that was pitched. Before starting on the drawing, I need to decide whether I want to take a more story-centric or graphic design approach to the cover. I’m equally a fan of both directions, but in this case, opted for the “scene out of the story.” I then pulled up some images of athletes running and sprinting, trying to generate some inspiration and understanding details to capturing figures in motion. I sent three rough concepts to series editor Brian Cunningham, one featuring The Flash being flipped upside down, another with turbine’s winds tearing his uniform off, and the third an iconic shot of The Flash charging at the villain with winds and debris surrounding them. Unfortunately there are no rough sketches running around on these variants, it would have been great to see the other two even in rough form, unfortunately they’re lost to the vault or possibly a comic convention booth to be shown at a later time, hopefully it’s something that can be shared though. Aquaman #8 follows up from there, Ivan Reis taking charge with the lead cover for the new storyline of “The Others” which starts off this week in #7, unfortunately it doesn’t tell much more. 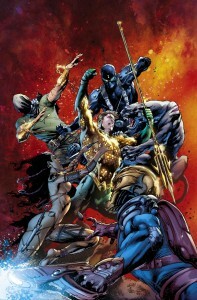 The graphic cover has Aquaman getting taken apart by an aggressive crew the likes of which we haven’t seen before. If this is any indication of how the story will start to spiral it would be best to catch issue 7 as soon as possible to see what rests ahead for the water one.